Paradise and High Seas | So Many Exciting and Beautiful Places! Arrived at Rarotonga this morning. Seas are choppy, it was low tide, and we were using tenders again. Cruise staff suggested that those people who are not steady on their feet wait until later in the day when the tide rose. The ship was not able to tender from the original planned location, so they had to go to the other side of the island, which is less populated. In other words, fewer shopping opportunities. Bummer! Getting onto the tender was fairly easy. When we arrived at the dock, the staff put out steps on the boat, but it was still about a two foot step up from there. Mark and I are fortunate that we don’t easily suffer from seasickness. We’ve endured high waves in the past with minimal queasiness. Today’s tour was an island nature walk. 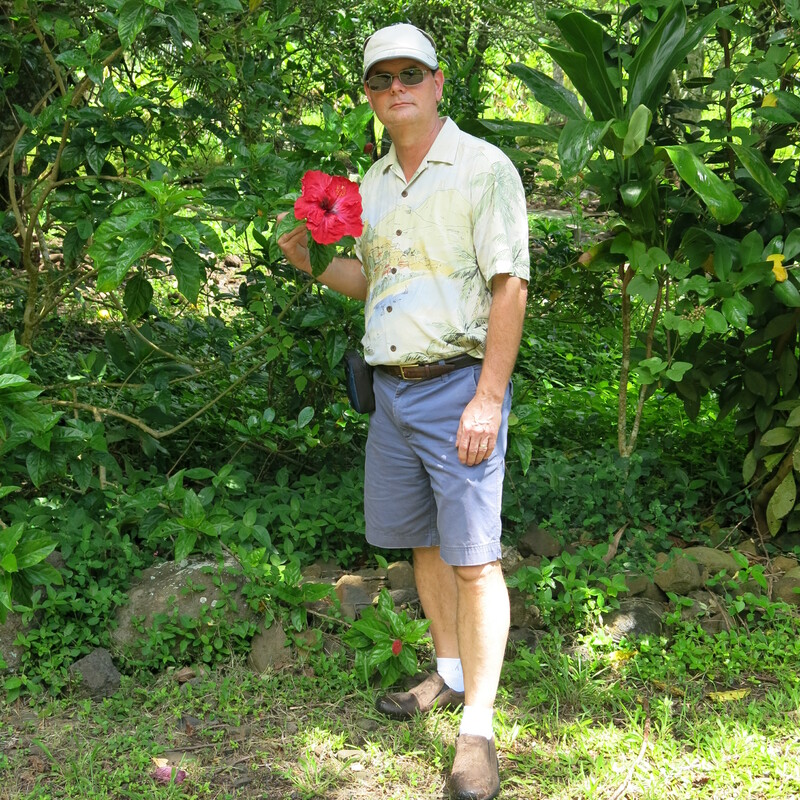 Our guide was “Pa,” the island’s herbalist. He arrived wearing traditional native attire, and took us to his home where he practices his herbal healing. 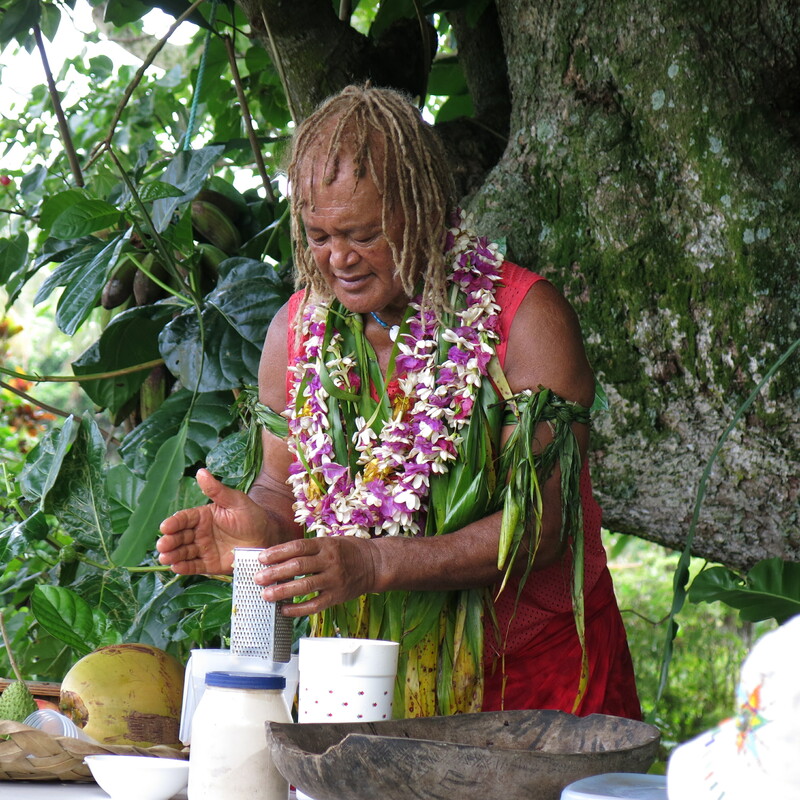 He discussed the benefits of some of the local fruits and nuts, and served us a concoction with pineapple, kava, and another herb which is helpful for prostate and hormone issues. Kava is a narcotic, and it actually numbs the lips and tongue a little bit. I also felt drowsy later, in fact, took a three hour nap after we returned to the ship. We sampled several fruits: mango, passion fruit, bananas and coconut. 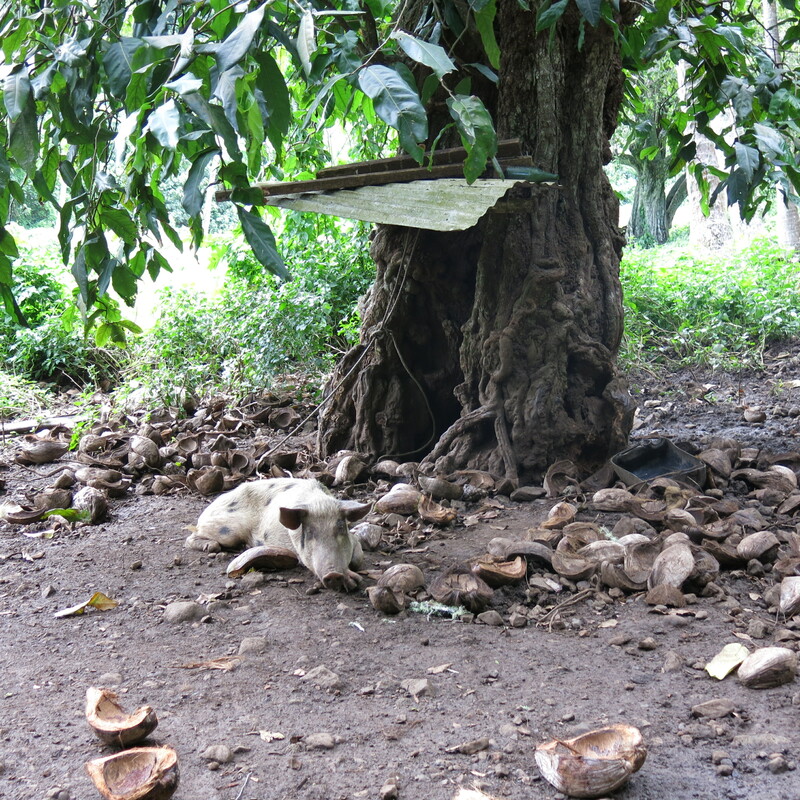 He told us that the Noni fruit helps repel insects. It smelled bad enough to repel Mark as well. I decided to rub it on my legs before going on the walk, because mosquitoes and gnats usually consider my flesh to be a delicacy. When I’m in a group, they attack me and leave everyone else alone. 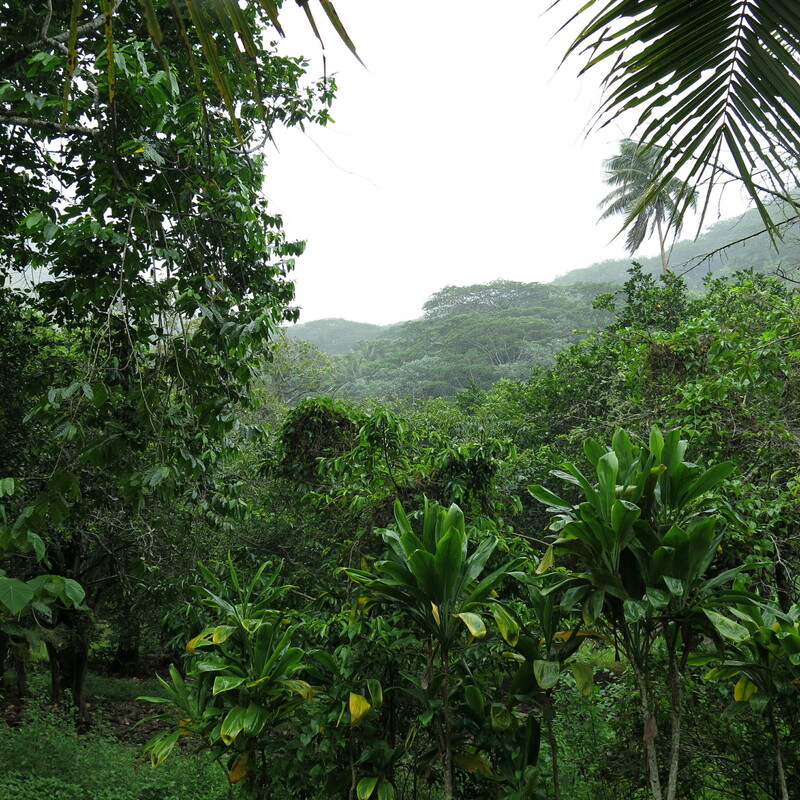 We walked into the rain forest about a mile, observing and learning about the local flora. The hibiscus are huge, as tall as trees, with large, vividly colored flowers. Everything is thick and green – you would need a machete to cut your way through if there weren’t paths that are used regularly. There was a light warm rain at one point on the walk, which was quite refreshing on a hot day. The Noni fruit worked like a charm. I got only two bites, and those were on my hands where I hadn’t used the fruit. I’d like to try this on a Minnesota summer evening. Getting back on the cruise ship was an adventure. 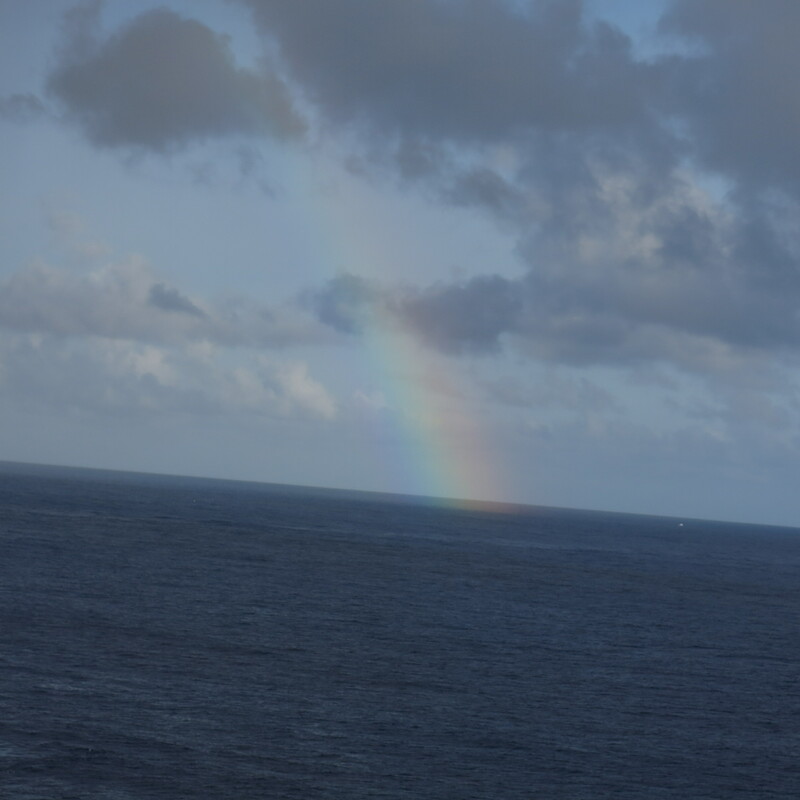 The seas were more choppy than this morning, and we had to stand at the tender door and wait for the tender to rise up close enough to the ship door before leaping on. After dinner, we went to one of the lounges and listed to some light jazz. The meals here are delicious. There’s a lot of variety, and I getting my seafood fix while we’re on board. Mark’s enjoyed duck and lamb, among other carnivore treats. Service is outstanding. I could learn to live like this. 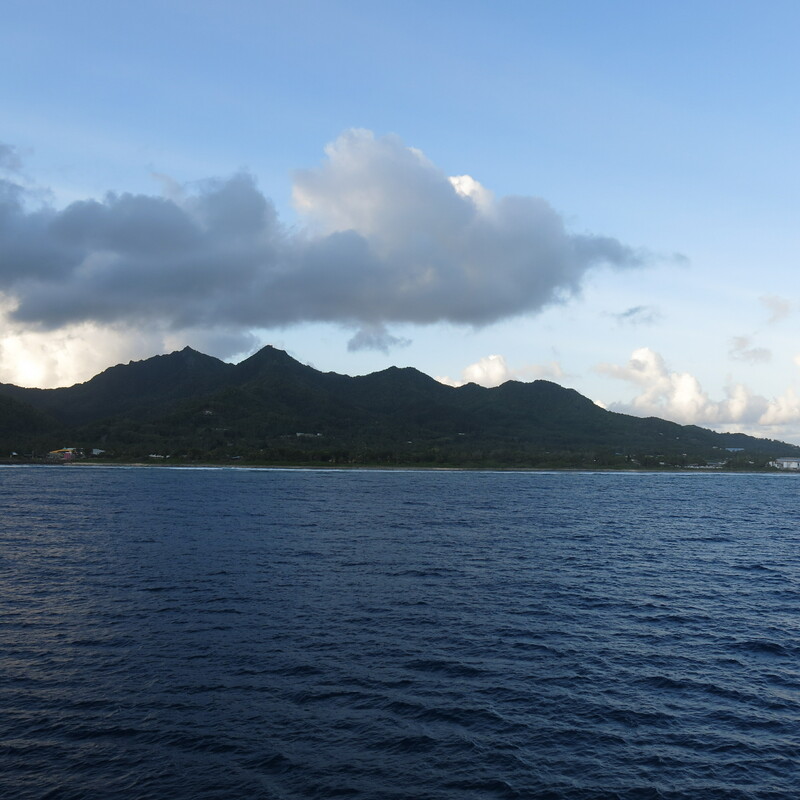 This entry was posted in South Pacific Travel and tagged Crystal Symphony, Rarotonga. Bookmark the permalink.